After 3 km. along the road from Chania to Souda we come to a turning to the right which leads to the Chrysopigi (or Zoodochos Pigi, “life-receiving spring”) Monastery, consisting of a three-apsed church surrounded by a wall. 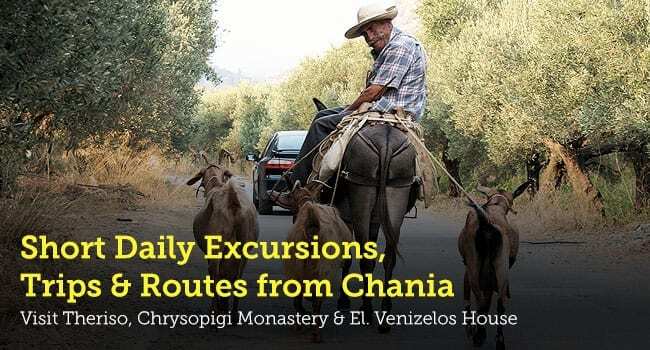 If we continue to the west from the Chrysopigi Monastery (or return to Chania by the road along which we came and then head south), we will come, after 3.5 km., to the village of Mournies, where Eleftherios Venizelos was born. His simple stone-built house still stands there, with a collection of his personal effects in the form of a museum. The area around the village is densely planted with olive and citrus trees. Approximately 500 m. outside the village is Agia Marina, a cool oasis with plane trees, springs of running water and stone benches. Also near the village is the famous Koukounara mansion, a building in the Venetian style with gardens, fountains and the winged lion of St Mark. Nearby is the monastery of St Eleutherius, a seventeenth-century building of considerable architectural interest. We leave Chania in a westerly direction, for Kissamos, and soon come to a turning (left) through the village of Perivolia to heroic Theriso. Part of our route leads to the imposing Theriso gorge or gorge of Eleftherios Venizelos, 6 km. in length. Two kilometres before we enter the village is the Kato Sarakina or Elliniko cave, which has produced archaeological finds showing that it was a place of worship in Neolithic and Minoan times. 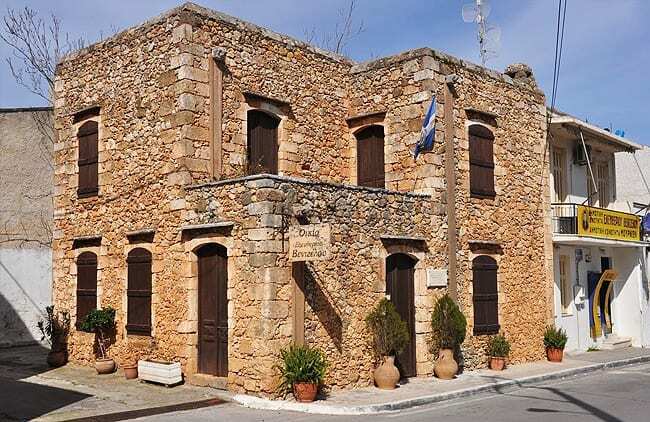 The historic village of Theriso stands among the foothills of White Mountains at an altitude of 500 m. This place played an important part in the modern history of Crete, for its inhabitants never ceased to fight the Turks. The events of 1905, when Eleftherios Venizelos and his supporters here declared the outbreak of a rising that went down in history as the “Theriso Revolt”, made the village more significant still. The rebellion was a protest over the totalitarian regime of Prince George which the Great Powers had imposed. The revolutionaries compelled Prince George to resign from his post as High Commissioner and paved the way for union with Greece. In the village, the house which Venizelos used as his headquarters may be visited. This entry was posted in Chania, Crete Attractions & Tips on June 1, 2015 .